A View of the Rockies supports urban infill and redevelopment efforts in Denver and believes that making Denver a denser, more transit-oriented city will promote the metro area’s physical, economic, cultural, environmental and social well being. Of course these changes to the built environment need to made in a way that is respectful to the cultural, historical and architectural context of the neighborhoods in which they occur. As we promote and celebrate the exciting changes that are happening in Denver today, we should always keep in mind that we want to avoid the mistakes of the past by preserving historically and culturally important places. Let’s also keep in mind that building and maintaining a unique “sense of place” and promoting cultural and demographic diversity are keys to making cities attractive places to live, work and visit. These benefits enrich the city for residents, keep people from moving out to the suburbs, attract young, creative knowledge workers who crave idiosyncratic urban environments, draw in tourists and convince business travelers to stay over for the weekend to explore the city. When I visited Denver a few weeks ago I spent time researching the history of Denver’s Chinese population in Lower Downtown and also exploring the Five Points neighborhood, the historic, cultural and economic center of Denver’s African American Community (more on Five Points in a later blog entry). Figure 1 from Master’s Thesis of Gerald E. Rudolph at Denver Public Library. This district was originally located between Wazee and Blake and 15th and 17th Streets (see area "A" in Figure 1 above) but around 1900, the Chinese settlement moved to the alley between Blake and Market between 20th and 21st Streets. (see area “E” in the Figure 1 above and Figures 2a-c below). Also visit http://www.denvergov.org/Portals/142/documents/BallparkSummary.pdf ). 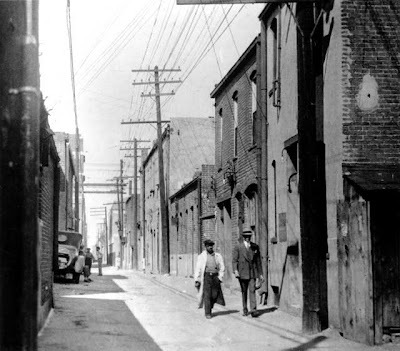 Figure 2a: The Alley where Denver’s Chinatown was located between Blake and Market looking from 20th Street toward 21st Street in 1929. Figure 2c: Denver's Chinatown in the Alley Between Market and Blake and 20th and 21st Streets. The Chinese community began arriving in Denver in substantial numbers in approximately 1870 and worked in railroad construction, gold mining, clothes laundering and other occupations. From the beginning, the Chinese suffered from hostility and discrimination including an infamous race riot on October 31, 1880 where one laundry worker, Look Young, was lynched and tens of thousands of dollars of damage was done to Chinese-owned property. The local press engaged in yellow journalism, writing sensationalized stories about opium dens, Tong wars and other vices ascribed to the Chinese population. Despite these injustices, Denver’s Chinese community persevered and developed a culturally unique micro-neighborhood in Lower Downtown Denver. Although the neighborhood’s population was never as large as San Francisco’s Chinatown (estimates of peak population range from 1,000 to 3,000 people), it was a vibrant, culturally and historically distinct district which made contributions to early Denver’s history, economy and culture. 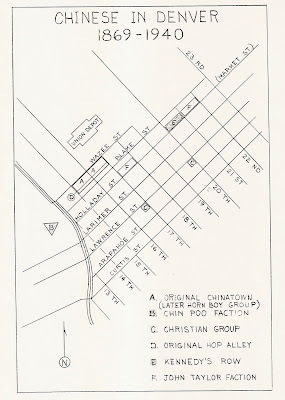 According to Sanborn Fire Insurance Maps from Denver in the early 20th Century, Denver’s Chinatown contained residences, businesses, retail stores and other Chinese-owned properties. 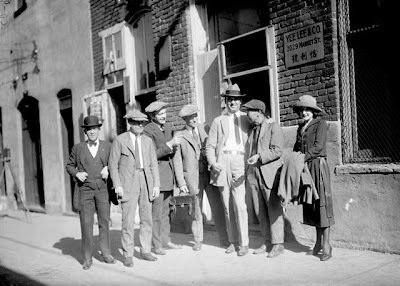 According to William Wei, as the Chinese population grew larger, the Chinatown district began to offer imported speciality Chinese products and provided a home for Chinese doctors, butchers, cooks, cigar makers and grocers, adding vibrancy and culture to Denver and bringing tourists to the city. In 1882, the U.S. Congress passed the Chinese Exclusion Act which prevented new Chinese immigrants from entering the United States. Over time this Act caused the Chinese population of Denver to decline. In 1940 many buildings in the near-empty Chinatown were razed “before the army of social betterment…under the orders of Lyle D. Webber, chief city building inspector,” (Denver Post, June 14, 1940, page 1) forcing the remaining Chinese population to disperse. According to The Denver Post, the condemned property, from 2021 to 2047 Market Street ,was owned by Chinese-American families up until the time the buildings were destroyed. Figure 3: Headline from June 14th 1940 article in The Denver Post. Today all that remains of Denver’s Chinatown neighborhood are memories and photographs. After the buildings which made up Chinatown were demolished, the alley between Blake and Market and 20 and 21st Streets, which was once the heart of the Chinese district, was filled in by the construction of warehouses and industrial buildings almost as if to permanently prevent the Chinese from ever returning to this location. Note, in the contemporary photograph in Figure 4 below, the alley is blocked by the large red brick "Public Storage" warehouse which was built across the right of way where the alley previously ran. Figure 4: Contemporary Photograph looking from 20th Street toward 21st Street, where the Chinatown Alley Once Ran Between Market and Blake Streets. The alley between Market and Blake Streets still exists between and 19th and 20th and 21st and 22nd Streets providing a hint as to what the alley would have looked like between 20th and 21st Streets if it was still in existence today. See Figures 5 and 6 below. Figure 5: Contemporary View of Alley Between Market and Blake Streets Looking From 20th toward 19th Street. Figure 6: Contemporary View of Alley Between Market and Blake Streets Looking From 21st Toward 22nd Street. Ironically, today many of the lots which contained the buildings which made up the Chinatown district are vacant or underutilized as is demonstrated by the contemporary photograph (Figure 7) below of the block between Market and Blake and 20th and 21st Streets. We lost a unique historical and cultural neighborhood and more than 65 years later we still don’t even have much to show for it. Figure 7: Contemporary View of Underutilized Property on Blake Street Street from 21st Street Looking Toward 20th Street Where Chinatown Buildings Once Stood. If the neighborhood had been left architecturally intact, it is difficult to say if Denver’s Chinatown would have organically rejuvenated itself as new cohorts of immigrants arrived in Denver or would have dwindled out of existence? If the neighborhood had survived, imagine how much more interesting and vibrant LoDo would be with a thriving Chinese-American economic and cultural district located across Blake Street from Coors Field? Sadly we will never be able to conclusively answer those questions because the neighborhood was destroyed. 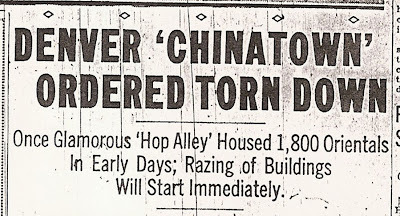 As we celebrate Halloween this year, let’s remember that it will be the 127th anniversary of Denver's infamous anti-Chinese riot and more than sixty-seven years since the physical buildings of Chinatown were destroyed. We can use these memories to guide us in future efforts to preserve and protect Denver's historically and cultural important neighborhoods as the city is redeveloped and reinvigorated. The following sources were used in this blog entry: The Denver Post, “Denver ‘Chinatown’ Ordered Torn Down,” June 14, 1940,” and “Hop Alley, Tong War Now Dim Memories," April 26, 1949; The Chinese in Colorado, 1869 – 1911, Master’s Thesis of Gerald E. Rudolph at the University of Denver, August 1964; “History of and Memory: The Story of Denver’s Chinatown,” William Wei in Western Voices: 125 Years of Colorado Writing, Colorado Historical Society, 2004. Denver Sanborn Fire Insurance Maps from June 1912, updated 1925, Volume 2, Map 183 and 184. Denver Sanborn Fire Insurance Map from 1929, updated 1961, Volume 1, Map 183. Special thanks to Bruce Hanson, reference librarian in the Western History and Genealogy Department in the Denver Public Library main branch who helped me uncover many of these sources. Wow what a great blog! It's a damn shame that we lost such a jewel from our city. I also feel sadness for the displacement of our own Little Italy in the Highlands, it seems as though Denver forefathers wanted to simply "white wash" our city and remove those that didn't fit into the future plans. What nickname should be used to brand Colorado's emerging alternative energy cluster? 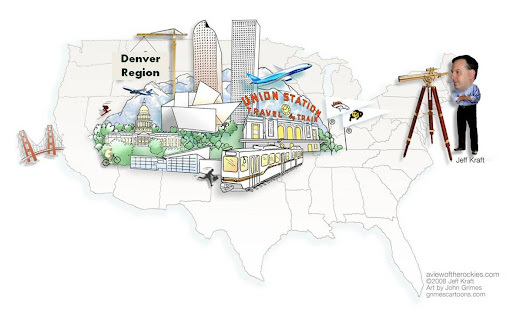 Commentary, analysis, data, theory, questions, and policy recommendations on economic development issues impacting Denver and the Rocky Mountain West from the perspective of a native Coloradan who has been living on the American coasts but retains a connection to Colorado (and is a life long Colorado Buffaloes and Denver Broncos fan).